An internship is an opportunity for both the company and the intern. That has been the lesson for both Lisa Boyle, a senior scientist in Mondelēz Australia's Consumer Science division, and her intern-turned-employee, Mei Kuang. "Mei was very keen to learn, which was great, and she brought a fresh set of eyes to a task that has been done by a number of different people," Lisa said. "She had some great ideas and a different perspective based on applying her skills from her university course." Lisa Boyle and Mei Kuang. Mei was studying the Master of Food and Packaging Innovation at the University of Melbourne. The degree was designed with industry partners including Mondelēz International and the Australian Institute of Packaging. The course spans the research and development product pipeline, from concept to production, with teaching by industry professionals and an internship program. Mei chose the course on the recommendation of one of her lecturers, who said the internship would be a useful stepping-stone into the food industry. 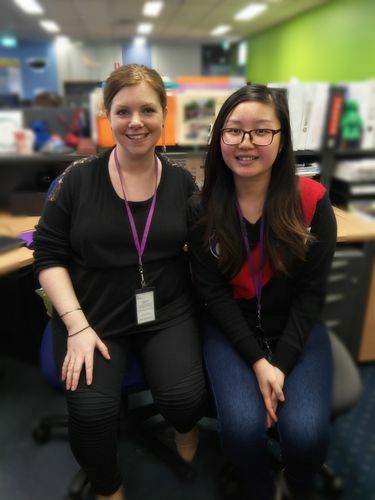 She interviewed with a pair of companies before she took a three-month internship offer from Mondelēz Australia's sensory science team; Mei had already completed a research project on sensory analysis and a consumer survey of Victorian wine. "I think that got them interested in me, that I had a bit of experience in sensory science," she said. Once she started, she applied what she had learned in sensory science, food chemistry and validation of new products. "People who graduate from our course have knowledge of a broad area… we are not specialists in food science, business or packaging, but we have knowledge of all three," she said. "I was able to learn on my own much of the time and gain a lot of hands-on experience with coaching from my team. You learn much faster that way." She said this breadth allows students to develop their skills in the workplace. Lisa Boyle said training a new staff member and sharing their experience were positives for her team. "In her time here we tried to give Mei a snapshot of a couple of different types of projects in the work that she was doing to help build that context for her in terms of the type of work that we do," she said. It also allowed Lisa to see how she performed in the workplace: when Mei applied for a position at Mondelēz, she had already seen her perform under pressure. "You don't necessarily get to see how people work as part of the interview process. The internship was a great opportunity to set Mei some goals and objectives and see how she approached the task." Lisa said internship was a great opportunity for both the intern and the company. "It gives the interns the opportunity to get a foot in the door; in Mei's case that work out quite well... And its great to get a fresh set of eyes and someone who's keen to apply their freshly-learned skills in a business context. I think it's important there is value to be gained from both sides." Learn more about the Master of Food and Packaging Innovation here. Story by Stuart Winthrope. Banner image: The University of Melbourne's sensory lab in Parkville tracks skin temperature, heart rate and facial emotional responses. Photo: Sarah Fisher/University of Melbourne.